synopsis (EN) Tetris Party is a deceptively simple, totally addictive puzzle game that is sure to keep you and all of your friends and family entertained for hours on end. The WiiWare game features ten never-before-seen single-player and multiplayer variations of Tetris, including Field Climber, Stage Racer, Shadow, and Wii Balance Board-enabled modes. 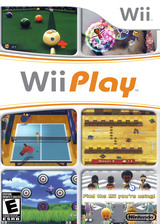 And several of the modes give users the chance to take advantage of the unique point-and-shoot capabilities of the Wii Remote. The party doesn't stop there. Take the Tetris fun online via Nintendo® Wi-Fi Connection, where you can play multiplayer Tetris against up to five friends at a time. You can also see how your Tetris Party skills stack up against the rest of the world using the global ranking system.